Apart from Boxing Day this is the first time since last November that we have been out on the bikes, as the weather and icy conditions haven’t been very favourable. 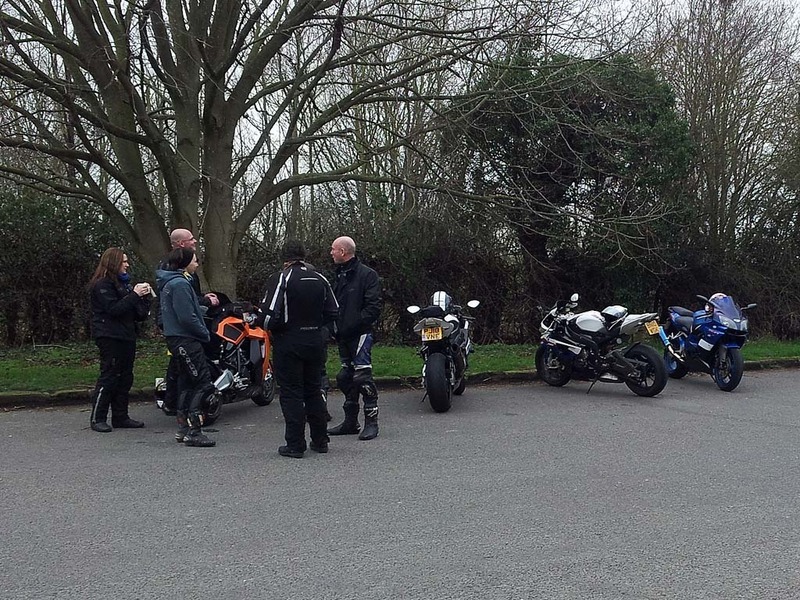 We met up with some of the guys from NUKB at Lymm Services for around 9am. I was out on the ZX-9R as the VFR’s MOT has currently lapsed and I am in the process of rebuilding the callipers as the front discs keep glazing over. We left Lymm Services on the M56 and the got off at Jct10 to join the A49 to Whitchurch. We continued on the A49 for a while before turning right onto the A534 to Wrexham. We skirted around Wrexham and joined the A483 and headed South for a short distance before getting off the dual carriageway and joining the A525 towards Llandelga. Somewhere along this road one of the guys picked up a puncture which ended up splitting up our group. I continued on the A525 and then joined the A5104 at Llandelga which I took to the A5. I then turned right onto the A5 which I only followed for a very short while before turning onto the A494 to Bala. The road to Bala is a good one but is often filled with lots of traffic, even at this time of the year. I arrived in Bala and stopped in the public carpark on the left as there are toilets there. I then left Bala and continued on the A494 to Dolgellau, this part of the A494 is even better and as some of the traffic usually stops at Bala it is usually a little bit quieter. An alternative route to Dolgellau is to take the A4212 from Bala past Llyn Celyn to Trawsfynydd. This is a very nice road with lots of different types of scenery. You would then turn onto the A470 and follow that to Dolgellau, this part of the A470 is a bit boring as it is very straight road. I stopped for lunch at Dolgellau where I expected the other guys to catch me up, but due to the puncture they had stopped at a farm café back on the A5. I was obviously now miles away from there so it wasn’t really feasible to head back there. So I left Dolgellau on the A470 heading towards Mallwyd but soon turned off and joined the A487 to Machynlleth. The A487 is a fantastic road and is also fairly quiet so you can usually get a decent run down it. The road starts off with some faster more open corners before you climb up to the top of the pass and then drop down on the other side. The way down is a twisty fast affair we a huge drop off to the right hand side. Just after Corris the road changes again as you get into the trees and follow the very twisty last part Machynlleth. Due to lots of double white lines in this area if you get stuck behind traffic it will be spoilt, so I would consider stopping and allowing yourself a clear run if possible. I arrived in Machynlleth and stopped at the fuel station to fill up, it is just after the railway bridge on the right hand side. I left Machynlleth on the A489 and then took the A470 towards Newtown. This part of the A470 is certainly worth doing and is pretty open and you can usually get a good run at it. At Caersws I joined the A489 and headed over to Newtown, unfortunately it was too late to head South on the fantastic A483 to Crossgates. So instead I headed North and followed the A483 through Welshpool and Pant towards Oswestry. This part of the A483 is really only a means to and end. As it is quite boring in places and usually full of a lot of traffic. I stopped at Oswestry Services to see were the other guys were currently. I got a text back to say they were at Whitchurch and would wait for me to catch up. So I left Oswestry Services and headed on the A495 through Whittington and Ellsemere and over to Whitchurch. Although not a challenging ride the A495 is very scenic for most of its length. 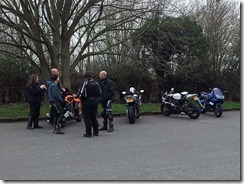 I then joined the A525 and A41 to met up with the other guys at Lynns Raven Café in Whitchurch. We then headed home via the A49, M56, M6 and M62/M60.